What were the animals on the Coat of Arms of Edward IV of England? Is there some historical/heraldic source confirming just what the animals on Edward IV's Coat of Arms were? They are two lions argent supporting the Royal Arms which also sports a lion. That said, Edward IV's list of approved badges includes a Wolf argent (of Mortimer). His grandmother was Anne de Mortimer. Technical note: A symbol IN a coat of arms is always within a field of a specific color that has a obvious edge or border. The field may be a shield or a roundel or a cartouche or a flag or a medieval surcoat (thus the phrase "coat of arms"). In this case the shield is divided into four quarters, and the second and third quarters are red, with three gold lions passant. Symbols within one or more of the quarters are the only symbols that can be called "IN" the coat of arms. The shield is being held up by 2 white lions that are called supporters and are part of what is called an "achievement" (complete display) of arms. As an example, the COAT OF ARMS of the United States of America is white with six red vertical bars and a blue horizontal area at the top. The ACHIEVEMENT OF ARMS of the United States of America has the coat of arms on a shield on the breast of a bald eagle displayed in natural colors with an olive branch in one claw and thirteen white arrows in the other claw. The eagle holds a ribbon with a motto in its beak and there is a "glory" with thirteen white stars on a blue field above the eagle's head. Thus the eagle is not "ON" the coat of arms because the coat of arms is on a shield on the eagle's breast. 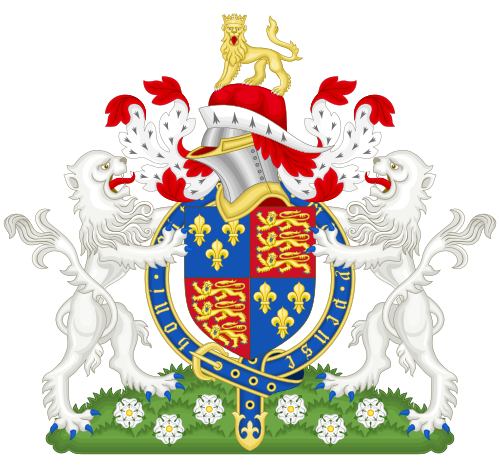 In Edward IV's achievement of arms the white lions are not ON the coat of arms or IN the coat of arms or ON the achievement of arms but are part of and thus more or less IN the achievement of arms. Someone was nice enough to answer the question you intended to say, but the question that you actually wrote (copying an earlier statement) literally has no correct answer since there are no white animals ON that coat of arms. Not the answer you're looking for? Browse other questions tagged england united-kingdom britain heraldry or ask your own question. Why were balls used on the Medici coat of arms? Was coat of arms of Afghanistan of 1928 influenced by Soviet symbols? In British heraldry, what happens when a woman with a coat of arms marries someone without? Whose colors/coat-of-arms did men-of-arms wear in a feudal army, 14th century? Why do (almost) all countries have a flag, coat of arms, anthem, national holiday etc.? What were the coat of arms / flags of Lotharingia? What do the letters “L” and “G” mean on the coat of arms of the city of Liège? How much smaller were medieval farm animals in England than today?